Airtel is the largest mobile network operator in India and is the third largest operator in the world with over 325 million subscribers. You can manage all your Airtel services with just a click of a mouse. All you have to do is log on to the Airtel site to manage your prepaid and postpaid plans, broadband, fixed line, DTH, money and many other services. The advantage with Airtel is you can find pocket-friendly data packs and you don't have to spend much on any kind of recharges. And, if you still want the services at even affordable prices then use these promo codes. Airtel Recharge is offering Rs 100 talktime on top up recharge of Rs 100. Here you recharge with Rs 100 and get Rs 100 talk time in Airtel.in only. No discount code is required to get this offer. Recharge now. Airtel Digital TV Recharge offer brings 1 Month FREE by making recharge for 2 months. Recharge for Rs 191 and get 13 Hindi channels in HD. Don't miss this Hindi Manoranjan offer! Airtel prepaid recharge offer today is here. Recharge with Rs 349 and get unlimited calls + 1GB/day for 28 days. No coupon code is required to get this best deal on Airtel recharge. Recharge now. Verified on 22/4/2019 . With Paytm Recharge, recharge your Airtel number or make bill payment. Every hour for 10 lucky customers can get 100% cashback by using this promo code. Maximum cashback is Rs 100. This promo code for Paytm mobile recharge can be used on DTH, prepaid recharge, mobile postpaid bill, data card and landline bill payments. Do as many transactions as possible and get a chance to win 100% cashback. Use coupon code to avail this cashback offer. Paytm Recharge is offering 100% cashback offer for all its users. Use this Airtel Recharge promo code to get 100% cashback on your Airtel number recharge or bill payment transactions. Maximum cashback is Rs 150. Every hour 7 lucky winners can avail this offer. 1. Wifi router at zero cost. 2. Upto 100 Mbps speed. 3. 100GB for Rs 700 per month, 200Gb for Rs 1050 per month. Airtel Recharge is giving best recharge platform for all Airtel users. Here it is offering 3G/4G data of 1GB for just Rs 97. No promo code is required to avail this amazing data recharge plan. Click to get it now. To get 1 GB (3G/4G) data for Rs 51, Airtel customers will have to recharge their prepaid mobile numbers with Rs 1498. The recharge will include 1GB of data valid for 28 days. After limit is reached, the next Airtel internet recharge of 1 GB data can be bought for Rs 51. This can be valid for 12 months. No Airtel discount code is required to avail these Airtel mobile internet plans. Recharge now. 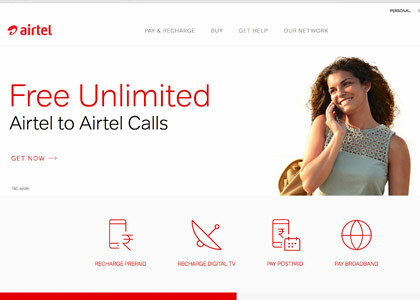 Airtel Recharge is offering online recharge services to all its users. Order Airtel SIM online and get it delivered to your door step. Also get 30 GB FREE data. Order online and get these benefits right now. Airtel Recharge offers special combos for its customers. Recharge with Rs 128 and get 125 MB 2G data, which is valid for 28 days and Rs 28 talk time without applying any coupon code. Recharge today. Airtel Recharge is offering free data to its users. Here you get free data for 12 months on 4G hand set. Also you can choose from landing page infinity plans and get more benefits on Airtel online recharge. No Airtel Recharge promo code is required to get this offer. Recharge today. Airtel money presenting exclusive deals and promo codes for mobile app users. Recharge with HappySale Airtel Recharge promo codes and get more savings on mobile recharge, 2G, 3G, 4G internet recharge plans, Airtel DTH recharges, top-up plans, roaming, bill payments of postpaid etc. Recharge today. Airtel Recharge infinity plan offers unlimited local calls, unlimited STD calls, unlimited roaming calls (incoming only), 100 local+STD SMS per day, 4G/3G internet 3GB for just Rs 499 only. Select any plan based on your requirement and recharge now. Airtel 3G recharge offer for all users is here. Recharge here with Rs 29 and get 200MB 3G data which is valid for 28 days. No Airtel coupon code is required to get this offer. Recharge today. Airtel Recharge offers 200 MB 2G/3G/4G data for just Rs 25. This data should be used within 28 days. Recharge your Airtel number using offers from Happysale and get awesome savings on your recharges. Airtel Recharge offers 200 MB 2G/3G/4G data for just Rs 25. This data should be used within 1 week. Recharge your Airtel number using offers from Happysale and get awesome savings on your recharges. Recharge your Airtel number with Rs 7 and get all local Airtel calls at just 10p/min. This 10p/min is valid for 28 days only. Recharge your prepaid Airtel number here and get exciting discounts. Recharge now. Airtel Recharge is offering awesome savings on recharge. Recharge here for just Rs 300 and get Rs 330 talk time. While making recharge pay using credit card or net banking or Airtel Money wallet or debit card etc. Recharge today. Verified on 22/4/2019 . With Paytm Recharge, recharge your Airtel number or make bill payment. Every hour 10 lucky customers can get 100% cashback by using this Airtel postpaid bill payment coupon code (LUCKY10). Maximum cashback you can get using this code is Rs 100. This Airtel Recharge coupon code for Paytm mobile recharge can be used on DTH, prepaid recharge, mobile postpaid bill, data card and landline bill payments. Do as many transactions as possible and get a chance to win 100% cashback. Airtel is offering best plans for family members. New family plan at Rs 199 only. Click to activate and avail the offer. Save Upto 40% of expenses and Get 1000 messages every month. Not only this offer get the offers like Airtel full talk time recharges, online recharge for prepaid mobile, recharges with suitable plans, Airtel 3g online recharges, Airetl dth online recharge, Airtel online recharge full talk time, Airtel prepaid tariff plans, Airtel online recharge full talk time 150, Airtel online recharge full talk time 40 and many more. Airtel Recharge portal makes your recharge very simple. Get Free 5GB Night Data by downloading Airtel mobile app. Get rewarded for recharges, listening to music, watching movies, enjoying games only through myAirtel App. No coupon code is required to avail this discount. Recharge now. Airtel Recharge brings a free 8 GB pen drive on Airtel HD connection. Take a HD connection with Airtel digital TV HD and record your favorite programs. Simply connect a pen drive to your HD set top box and start recording. No Airtel Recharge offer code is required to get this free gift on your HD connection. Airtel presenting exclusive deal for their users. Get 4G data plans for 3G prices. Just click here to grab this deal. This Airtel Recharge discounts valid for new users and old users. recharge your airtel mobile in online and enjoy the fun in mobile with fast 4G internet . promo code is not required to grab this deal. This offer available in Hyderabad, Bangalore, Bombay, Pune, Delhi and many more cities in India. Recharge Your Airtel prepaid mobile in online with best offers on 3G and 4G data internet packages. Recharge your Airtel mobile prepaid or postpaid and get best offers on 3G & 4G data plans. These data recharge offers available in Hyderabad, Bangalore, Pune, Bombay, Kerala and many more cities in India. Click to grab 100% working Airtel mobile recharge 2g, 3g, 4g data plans and promo codes. Recharge now. Airtel Recharge offers special surprises for our 2 million broad band users. Airtel is celebrating 2 million happy customers by giving away exciting surprises to all our broadband users. It's their way of saying "Thank You" for your trust. Get it now. Recharge your Airtel number with Rs 140 and get Rs 140 talk time. Also get extra cashback for new users. Recharge using HappySale Airtel Recharge offers today and get huge discounts. Recharge today. Airtel Recharge brings its digital tv infinity pack for just Rs 5500 only. Get all HD and SD channels for 1 year at just Rs 5500 without applying any coupon code. Recharge today. Airtel Recharge is offering all local and STD calls + 2GB 3G data valid for 28 days at just Rs 249. No limit for your calls without using any coupon code. Get unlimited talk time using Airtel online recharge portal. Don't miss this offer from Airtel Recharge. Airtel Recharge offers 700 MB data for just Rs 99. Recharge here and get 700 MB data with 14 days validity. No coupon code is required to avail this offer. Check the landing page for more recharge & SMS packs and get discounts. Recharge now. Airtel Recharge brings Infinity pack on digital TV recharge. Get all HD & SD channels for 1 year at just Rs 5500. No promo code is required to get this offer. Recharge your Airtel digital TV now. Airtel DTH Recharge offers South Max pack at just Rs 183.month which Includes 30 + extra 15 days SD channels, 12 month recording and 1 month iTV services. Subscribe now. Airtel Recharge is offering best deals on mobile, digital TV and broadband transactions. Here get Broadband plans with speed upto 100 mbps. No coupon code is required to get this offer. Get 50% Off on airtel mobile recharge. Surf internet during the night from 12 AM to morning 6 AM and Get back of 50% of data consumed. just enter your mobile number and activate the offer. This offer valid for new and old users. This offer available in all over india like Hyderabad, Bombay, Chennai, Delhi, kochi, Vizag and many more cities in India 2016.Hurry up.!! Recharge your prepaid mobile in online Get best offers on 3G and 4G internet plans 2016. Now make your recharges and bill payments ever easy and affordable with Airtel Recharge. It is giving away Rs 9 cashback on every transaction for recharges and bill payments of prepaid and post paid. Use this coupon at the check out page. Not only this avail the best postpaid plans, prepaid plans, instant cashbacks, exclusive mobile recharge coupons, electric bill payments, prepaid & post paid DTH bill payments and many. Recharge now. Airtel presenting massive deals on online internet recharge. This deal valid for new and old users. Click to grab More online cashback airtel prepaid 3G and 4G internet data plans. Hurry up.!! Promo code is not required to avail the discount. Airtel is giving best deals on DTH recharges. Get Rs 25 Cashback on airtel online DTH recharge. This promo code valid on minimum Recharge of Rs 250. Cashback will be credited in the Airtel Money wallet within 2 business days from the day of transaction. This promo code valid on 2 transactions per user. This online airtel digital tv recharge promo code valid on Hyderabad, Bangalore, Pune, Chennai, Delhi, Gujarat, kerala, kolkata, Tamilnadu, Karnataka, Rajasthan, Jammu, Punjab, Andhra pradesh, Haryana, Maharashtra etc. We can pay through paytm, mobikwik, payumoney, oxygen wallets and debit and credit cards of all banks like Icici, Citi, Sbi, Axis, HDFC etc. They provide different packges like Montly, half yearly & yearly. This airtel DTH rechrge voucher code can be valid for new users only not for existing users for free. Get Rs 100 cash back on every recharge like Data card, Mobile prepaid & postpaid, Digital tv, Airtel 3G & 4G internet recharge plans, full talk time, net recharge & bill payments for all operates.airtel online recharge using debit card, airtel online recharge using sbi maestro debit card, airtel online recharge sms pack, airtel online recharge rate cutter. This coupon can be availed only when the payments are made using the Airtel Money app and maximum cashback will be Rs 100. This coupon valid on one tractions per one user. Click to get more online airtel recharge coupons, discount codes, vouchers, for free. Hurry Up.!! Shop with Happysale online deals and save on your online shopping. Happy Shopping - Happy Saving. Now make your online recharge more easy and comfortable with Airtel Recharge Promo Code. Enjoy Rs. 100 cashback on online Airtel 3G & 4G Recharge Plans. Also get recharges for postpaid bills, data card recharges, Airtel prepaid recharges, easy mobile recharges online, prepaid & postpaid recharges, wireless internet recharges, broadbrand recharges, digital TV recharges, recharge with best suitable plans, Airtel money cashback Promo code, Airtel 30 days recharge offers, SMS packs and lot more. This Promo code is valid for users in Hyderabad, Bangalore, Chennai, Delhi, Pune and many more cities in India. This promo code is provided by Airtel for free. Hurry up.!! recharge now and grab the discount. Online deals have become much more than attractive offers on clothes and accessories! Today, the mobile network service providers too are coming up with some of the best deals that completely grab worthy and will customers to save a huge deal of money on the mobile bill expenses. Airtel today is a household name when it comes to mobile connectivity! And for the avid online shoppers that would want to make the most of their mobile connection deals online, can opt-in for the wide range of Airtel promo code that has been made available online, by HappySale. The world is a small place and staying connected with your near and dear ones are something that everyone wants. And when you have access to the best Airtel discount code then you can keep connected with anyone you want at a less price. These coupon codes allow you to make the most of the promotional offers and the cash back offers! In addition to that, there are deals that the first time users too can make use of and decide whether or not to subscribe to Airtel on the long-term basis. Once you are an Airtel customer, you will be Airtel customer forever. The raining offers are always there to shower you with huge coupon codes. Its Airtel Prepaid recharge offer gives unlimited calls and a data of 1GB/day for just Rs 349. even when you are doing Airtel mobile recharge or making any bill payments, be assured that you might be getting 100% cashback. How to choose and apply Airtel coupon codes? Open HappySale site and look for Airtel listed on our website. Choose the relevant coupon based on your preference. Click on the coupon code and copy the coupon code. Or you can visit the Airtel page and apply the coupon code. Once the coupon is applied, you will receive discount. If you are searching for some of the best Airtel recharge offers, then you will find them in HappySale. This is one website that makes searching for the best online Airtel recharge and other offers easy, by listing the some of the best deals on its website. So all the online customers will have to do is browse through the HappySale website and sort out the listings of the coupon deals that have been listed and opt-in for the ones that are applicable to them! However, make sure you activate the coupon codes within the validity time.